The emerging discipline of space meteorology aims to reliably predict solar flares so that we may better guard against their effects. Using 3-D numerical models, an international team headed by Etienne Pariat, a researcher at LESIA (Observatoire de Paris / CNRS / Université Paris Diderot / UPMC), has discovered a proxy that could be used to forecast an eruptive event. The proxy is associated with magnetic helicity, which reflects the extent of twist and entanglement of the magnetic field. The study is published in the journal Astronomy and Astrophysics dated 17 May 2017. 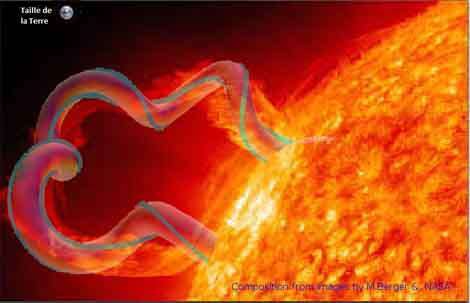 Solar flares or eruptions are one of the most violent phenomena in the Solar System. They coincide with a sudden, violent reconfiguration of the magnetic field, releasing huge amounts of energy that can eject billions of tons of solar material into space at speeds of over a thousand kilometers per second. Although numerous parameters have been studied, the probability of forecasting a major flare one day in advance is currently no greater than 40%. And yet the most powerful flares can lead to major disruptions on Earth, causing interference with telecommunications or knocking out electrical power grids across entire regions of the world. Our technologies, which are increasingly dependent on electrical components and on satellites (GPS, telephony, etc), are thus ever more sensitive to solar activity, while such flares can even put astronauts' lives in danger. One of the aims of space meteorology is to forecast solar flares, in the same way as meteorological services forecast storms on Earth. Looking for a predictive parameter, the astrophysicists based their work on 3-D numerical simulations, which use computers to reproduce the behavior of the magnetic field in the Sun's atmosphere as well as the formation of sunspots, where eruptions take place. The researchers tested various parametric simulations and analyzed changes in magnetic energy and magnetic helicity, a quantity that measures the extent of entanglement and twist of the magnetic field. For their study, the researchers carried out computer simulations of two scenarios, one with an eruption and the other without. Their initial calculations confirmed that neither magnetic energies nor the total helicity of the magnetic field fulfilled the criteria for a predictive factor. 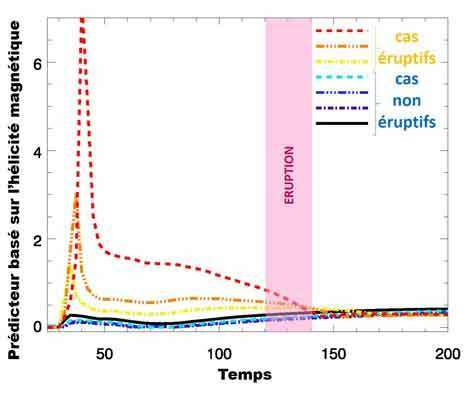 Using a complex mathematical approach based on the separation of the magnetic field into several components, the researchers successfully obtained a proxy capable of predicting eruptions. The proxy (which compares two helicities in the potentially eruptive region) remains low in non-eruptive scenarios; whereas in every other case it increases significantly before the eruption (see Figures). The study, carried out as part of the HéliSol program, thus opens the way to more effective forecasting of solar flares. The theoretical findings now need to be confirmed by analyzing observations of active solar regions. This is currently being done as part of the European Flarecast project, which aims to set up an automatic system for forecasting flares. a researcher has discovered a proxy that could be used to forecast an eruptive event. The proxy is associated with magnetic helicity, which reflects the extent of twist and entanglement of the magnetic field. You mean that the eruptive events may be related to electric currents flowing in the plasma? It must be because that is the only way to create helical magnetic fields.